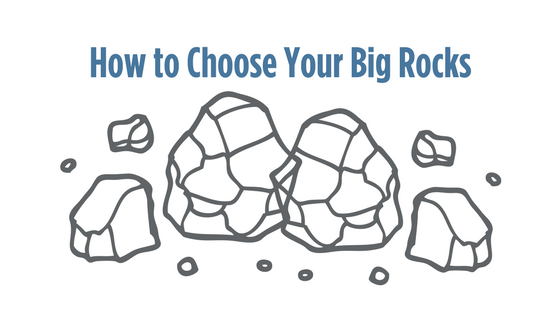 It’s a classic object lesson: you can’t fit big rocks into a jar full of sand, but put the big rocks in first, and you can fill up the space around them. Keep this principle in mind as you commit tasks to your planner pages. At this point, you have your Master Task List and Weekly Compass Tasks ready to schedule. Once those are in, you can plan your other important and fulfilling activities to round out your week. What is the most important thing I can do in this role this week? As you develop strong weekly planning sessions, your life will have a new sense of perspective. A good weekly plan helps you see past the daily grind to where life’s milestones await. And that perspective makes all the difference. I recently completed The 5 Choices to Extraordinary Productivity, offered by the American Management Association. This is a Franklin Covey course and I was pleased to see a supporting planner when my catalog arrived this week. This blog is a great idea and am sure I will be inspired by it, along with the notes I took in class and my new planner when it arrives. I am feeling more organized and focused since the class. Thanks for offering this blog to help further the concepts and support us.